After establishing the look and feel of a fire door, and how it can be identical to a standard doorset, what is the actual difference? Like all of the doors made at Lewis Aldridge a solid core is the start of the door, the difference being fire doors hold individual ratings by selecting a FD30 fire door a prevention of the spread of smoke and fire will be prevented for 30 minutes extra compared to a standard door. 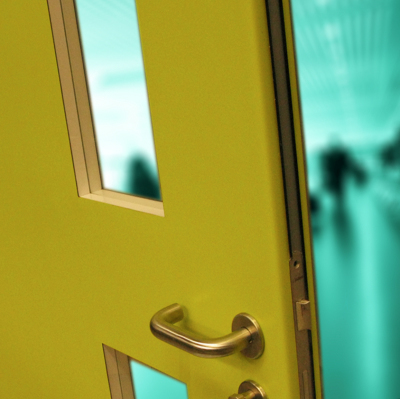 Fire doors are fitted with an intumescent strip along door and door frame, this is an unseen feature which rapidly expands when exposed to extreme heat to seal the gap between door and door frame. It is now generally acknowledged that, in the event of fire, it is smoke that is the major risk to occupants. Lewis Aldridge manufactured doorsets can offer FD30S and FD60S options as well as non-rated. In addition, we can offer FD90S and FD120S performance. Appropriate smoke seals and intumescents are included with our doorsets to suit performance.